Can Split Pea Soup Ever Be Pretty? Tasty, you bet. To the eye, it has the most unfortunate color and often sludgy texture. But close your eyes, and you will be transported to soup heaven. Rich, flavorful, nourishing and comforting split pea soup has global appeal. Vegetarian versions are as equally satisfying as those made with ham or bacon. Split pea will always be a nostalgic, family soup. It doesn’t remind us of our favorite gourmet restaurant or our most memorable meal, instead, it is a soup that soothes, calms, and makes us feel nurtured, at home, comfortable. But can split pea soup ever be pretty? We can only try. 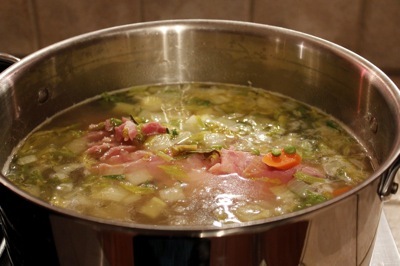 I make split pea soup with the leftover spiral-cut ham after Thanksgiving every year. Reserve several slices from the ham to dice and add to the soup at the end. Split peas are a variety of field peas grown specifically for drying. When the skins are removed during the dehydrating process, the peas naturally split in half. Sauté onion, celery, and carrot in olive oil in a large soup pot until softened. Add red pepper flakes, sauté another minute. Add the meaty ham bone and cover with filtered water. Add split peas, garlic, 3 or 4 bay leaves, a sprig of fresh rosemary and several sprigs of fresh thyme. Bring to a boil, skimming any scum from the surface. Lower the heat and simmer for 1 1/2 hours or until the peas have almost all disintegrated. This assures that the texture won’t be sludgy. 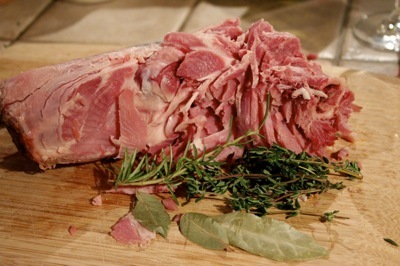 Remove ham bone, bay leaves and the sticks from rosemary and thyme. Add salt to taste. 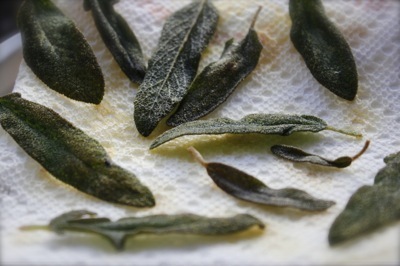 Fry fresh sage leaves in butter (I use Smart Balance) until lightly crisp, remove to a paper towel. Add diced ham and potato to the soup. Simmer another 10 minutes. Lastly, add fresh chopped parsley. Ladle soup into warm bowls. Garnish with a sprinkling of parsley and fried sage leaves (and chive blossoms if available). An alternative to croutons, crispy fried sage leaves melt in the mouth like buttery herbal candy. I must say I think you have done it and taken thus comfort dish to a whole new level Lori-Lynn. Your title made me smile 🙂 If anyone can make split pea soup pretty, you can! The shot with the spoon showing a bit of ham and carrot does the trick – now I’m craving a comforting bowl of warm pea soup. It sounds really good! A question: how did you do the spiral cut ham? It is wonderful! Hi Krisztina – Over 40 years ago, Harry J. Hoenselaar, the founder of HoneyBaked Ham, invented and patented a unique machine that slices a ham in a single, continuous spiral. So, I bought it already sliced. Isn’t it great? You not only made it look pretty, you made it look tantalizingly delicious! Yes, you managed to make split pea soup pretty! 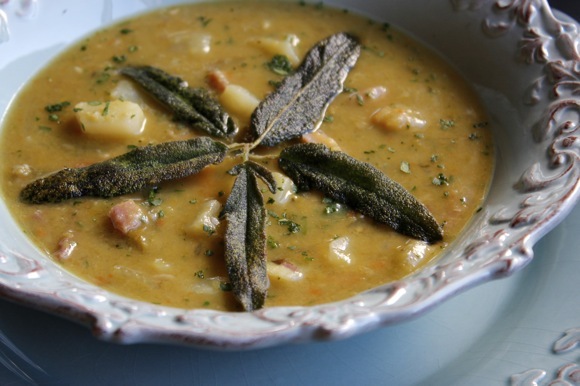 I love the addition to sage in this soup, and the pretty sage leaves on top. Nice work turning an ugly duckling into a swan! You definitely did it! Wow, everything about that dish looks and sounds absolutely delicious. 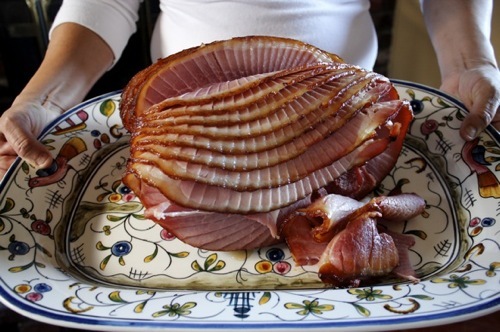 Also, your Thanksgiving ham is a work of art! Well done on making me crave this soup at only 07h40 in the morning! Agree, you did make it pretty, and you placed it in the most perfect dishes! If anyone can make split pea soup pretty, it’s most certainly you! You’ve done it – congrats! 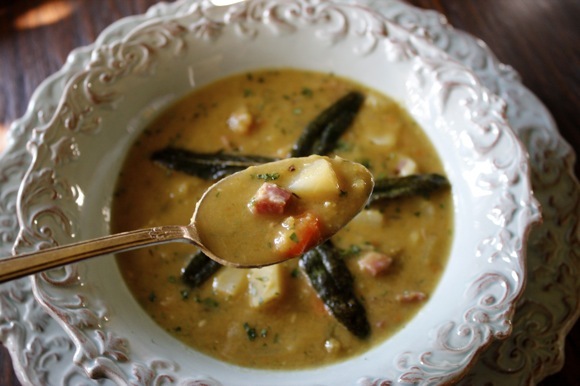 The soup is made even more delicious with the addition of fried sage, an inspired twist to the classic. Love rib-sticking split pea soup, great with a smoked hamhock in it and that spiral ham – always impresses. You did it! You made split pea pretty. If anyone could, I knew it would be you! You know, shooting soup is tough and you have done a masterful job.. what a beauty!!! The spiral ham shot is like a magical shell… just perfect!!!! Ohmigoodness, I want to come to yours for leftovers 🙂 I think your split pea soup looks beautiful, actually! Now I know what to do with the ham bone that’s in my freezer! I’m glad that I left lots of ham on it. Great post, LL. Leave it to you to make one of the ugliest (but tastiest) soups attractive – you did it! And I love the use of all those herbs – that’s what I’ll be doing next time. I bet this split pea soup is the best ever…including the beautiful ham!!! I had never made this soup at home before, but it used to be my Monday lunch when I was working because their Monday soup special was always split pea. I miss it… my kids and husband are not into split pea and I can’t make it only for myself… I’d love to visit you for a bowl of soup. 🙂 I think I won’t be able to drink split pea after I try yours though. Looks really, REALLY delicious!!! So pretty!!! great job Lori, only you could make it stunning!! 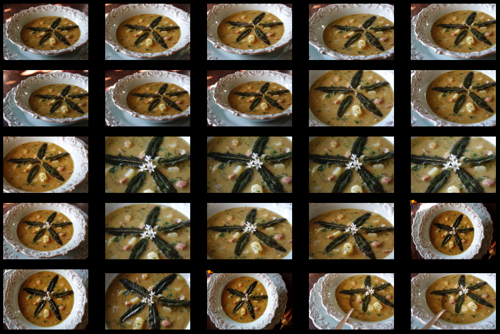 you know, the ONLY reason I’ve not blogged about split pea (potaje–as we call it) is because it’s simply not pretty. Ours is green in color b/c of how we cook it. No other vegetables other than butternut squash… It’s my absolute favorite pea in the world. Before black beans and chick peas, I’d devour an entire pressure cooker of split peas. I absolutely love how you decorated your soup. It’s simply stunning. You’ve given me inspiration to play around with our classic recipe and make into something appealing to the eye. Because the taste is definitely there! Brava. 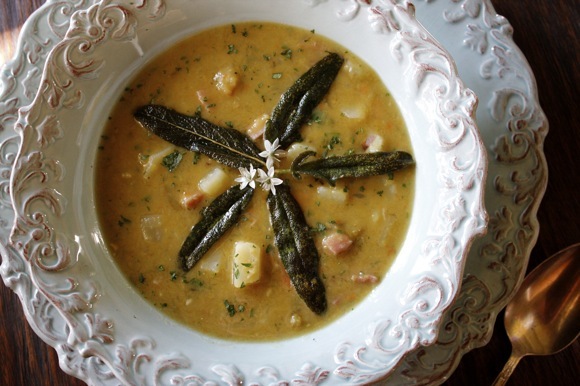 If anyone can make split pea soup pretty, you can, my dear—and you have!